If homepage, new tab page and default search in your browsers have changed to Search.socialdownloadr.com, this is the work of a browser hijacker. This hijacker is one of the programs or browser extensions installed on your computer; it might be Social Downloadr Toolbar, NowUSeeIt Player or some other app. Other than altering your browser settings, this program may generate advertisements (in-text links, pop-ups, banners and so on) in browser windows. You can follow the instructions below to remove Search.socialdownloadr.com from new tab page, homepage and default search of your browsers. 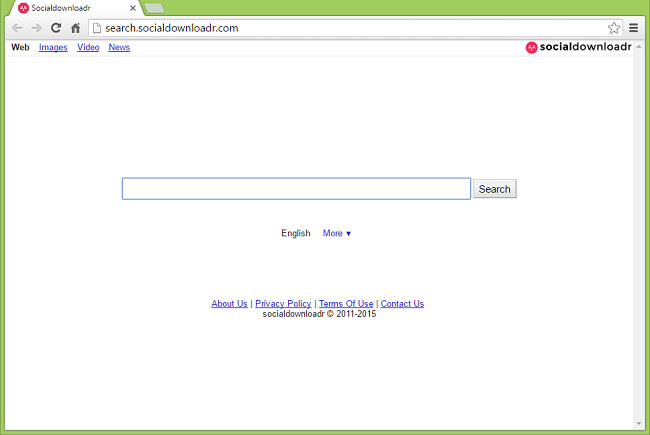 How Did Search.socialdownloadr.com Hijacker End up on My PC? Strictly speaking, Social Downloadr is a potentially unwanted program; though many people use the term “virus” to refer to any program with shady behavior, so they would call Social Downloadr a virus too. The reason it redirects users’ browsers to search.socialdownloadr.com is to boost this site’s traffic, as the site is supported by ads. Like other potentially unwanted programs, Search.socialdownloadr.com hijacker gets installed on computers bundled with free software from the web. The simplest method to uninstall Social Downloadr is to run an anti-malware program capable of detecting browser hijackers in general and Social Downloadr in particular. SpyHunter by Enigma Software is one of such tools; it finds and removes all files, folders and registry entries left by Social Downloadr. You can also try to remove Social Downloadr by hand using the following instructions. Go to Programs and Features, uninstall Social Downloadr Toolbar or NowUSeeIt Player if you can find them there. If you cannot find these, uninstall suspicious programs, programs you don’t remember installing, or programs you installed just before Social Downloadr appeared on your computer. When you are not sure if a program is safe, look for the answer on the Internet. Look for Social Downloadr in the list. If you find the app, highlight it. To get rid of Social Downloadr, either reset browser settings or remove Social Downloadr and any suspicious extensions from browsers and set new tab page and default search provider. Select the search provider you want and click Make default next to it. Click an x button next to hijacker search engine to remove it from the list. Under Appearance section put checkmark into Show Home button checkbox. Clear the textfield of the existing address. Put the one you want or select Use the New Tab page.